When first initiating this Show Jacket project, we sat down and decided on important parameters of which should be the values behind developing an ultimate product. These factors has become the foundation for all pieces in the Kingsland MASTER Collection that we now proudly present. Everyone who has spent some time on a horse back knows how essential fitting and function of the garment is. Moreover, especially at the moment when everything counts, -at the show! Of course, the garment itself should be attractive, but the cut must emphasize the posture and flatter the look of the competition rider. A Show Jacket should not prevent the athlete’s movements, but in opposite – allow full flexibility with highly technical, stretchy materials. All fabrics in this MASTER Collection are from well-known European weavers and are four-way stretch. Add water-resistant surface, quick dry function, moisture management and max breathability, -this high quality Softshell fabric is top-notch. The jackets has a soft Mesh-lining to give an additional comfort feeling. This allows the airflow between jacket and body to circulate. Under the heading “Made in Europe” we have found a perfect partner in one of the highest-levelled textile factories in Europe. All fabrics, as well as all accessories such as buttons, eyelets, logo plaques, labels, etc., have all been individually developed with the best European suppliers. All collars are made in Alcantara stretch. Off course, the garment patterns and all designs have been made in Europe as well. The design signature can be recognized in the combination of sophisticated selected and developed details as well as in the progressive style lines. For instance, the innovative MASTER Sporty Show Jackets has a dynamic design and matching sprayed-dyed logo buttons and embossed logo-insert at the collar. Further on, there are show jackets in classical design with elegant, timeless design and details of interest at pocket flaps and collar solutions. The dressage athletes are perfectly dressed in tailcoats with new and exciting collar shapes, logo-buttons as beautiful as jewellery and Swarovski decoration. An exciting new cross-discipline jacket for women with a delicate collar where black Swarovski-stones are sparkling and black enamelled buttons make the ultimate look. 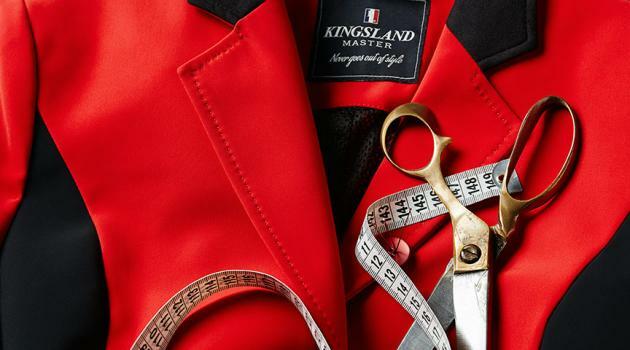 -Every design and detail exclusively created for the Kingsland MASTER Collection! There are three themes. SPORTY, ELEGANT and DRESSAGE. –All “smoking hot jackets” as our Kingsland Sales Manager, would have said. Common for them all, are the high qualities and features, like 4-way stretch, water repellent surface, moisture management, fully breathable, easy treatment & quick dry. Details like KL Master 3D print, metal eyelets for ventilation under sleeves and spray dyed buttons as well as KL Master metal plate on lower left sleeve adds the perfect touch. -And when we tell you that you can wash it in the machine using gentle cycle on 30°c, -we are out of superlatives! In the Sporty theme, we have SILA MASTER LADIES SPORTY SHOW JACKET and SAMSON MASTER MENS SPORTY SHOW JACKET. The high-gage knitted softshell fabric has a sporty and technical hand feel. The fabric is comfortable and resistant with a stabile construction. The design is cool and new, with black insert details in sides and on sleeves. We have used original Alcantara fabric on the collar and added an embossed logo on back neck. The pockets has taped zippers. SILA Master ladies sporty show jacket (KLCM-SJ-920) is available sizes 32 – 44 and comes in the colours: 316 Red, 270 Blue, 020 Navy & 090 Black, -all with 090 Black inserts and collar. SAMSON Master men’s sporty show jacket (KLCM-SJ-924) is available sizes 44 – 54 and comes in the colours 020 Navy & 090 Black, -both with 090 Black inserts and collar. ELVIRA MASTER LADIES ELEGANT SHOW JACKET and EMESTO MASTER MENS ELEGANT SHOW JACKET are the two first jackets in the ELEGANT theme. The design on these jackets are more chic and sophisticated compare to the SPORTY jackets. This makes them useable for both the show jumping and dressage arena. ELVIRA (ladies) has decorative stitching in waist and on shoulders, metal piping around collar and again, original Alcantara on the collar. For men, our designer has taken away the metal piping but added Alcantara details also on the pocket flaps. ELVIRA Master ladies Elegant show jacket (KLCM-SJ-921) is available sizes 32 – 44 and comes in 020 Navy & 090 Black. EMESTO Master men’s Elegant show jacket (KLCM-SJ-925) comes in sizes 44 – 54 and colours 020 Navy & 090 Black. The last jacket in the ELEGANT theme is the attractive and stylish FAIREN MASTER LADIES FEMININE SHOW JACKET. The bonded superfine Denier woven fabric with silky sophisticated hand feel is a comfortable, lightweight and strong fabric. The fabric on this elegant, feminine jacket has the same, high technological features as the on previous items. It was originally designed as a Dressage jacket, but when the show jumping- women in the office saw the jacket, we all agreed that also this is a cross-discipline jacket for the ones who would like to stand out in the crowd. Alcantara fabric is again used on the collar, -a standing collar that gives this jacket an outstanding design and appearance. Swarovski crystals sparkles along the collar edge. FAIREN Master ladies feminine show jacket (KLCM-SJ-922) is available in sizes 32 – 44 and colours 020 Navy & 090 Black. This leaves only the fantastic Tailcoats in the DRESSAGE theme. The first thing you notice with the DEVICA MASTER LADIES TAILCOAT, is the amazing, high, crystal-button-down, beige Alcantara collar. Wow! What a grand and majestic look! The beige Alcantara vest points a reversible, with Swarovski crystals. The inverted side of the vest points are in plain Alcantara. Crystal buttons on collar, front and sleeves gives the extra touch to this stunning coat! DONAHUE MASTER MENS TAILCOAT, is an outstanding coat for the male Grand Prix riders. With black Alcantara on collar and vest point, and spray-dyed buttons, riders wearing this coat will feel the quality and, hopefully convert that feeling in to the show ring. The fabric used on both the tailcoats is the bonded superfine Denier woven fabric as on Fairen and Devica. DEVICA Master ladies tailcoat (KLCM-SJ-923) is produced in sizes 32 – 44 whilst the DONAHUEMaster men’s tailcoat (KLCM-SJ-926) comes in the size range 44 – 54. Both tailcoats are available in 020 Navy and 090 Black. 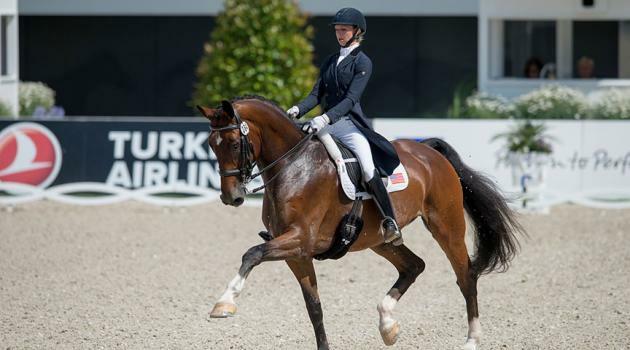 A few months ago, Norwegian Kingsland rider Camilla Storemark embarked on a new adventure setting off from home to work for Irish rider and Olympic medallist Cian O’Connor. 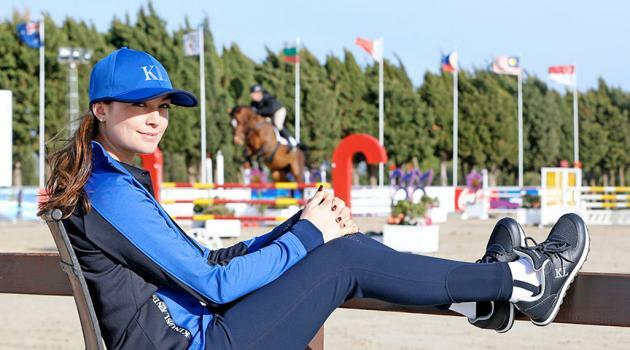 During February and March, Camilla is spending her days at the Sunshine Tour in Vejer de la Frontera, Spain together with O’Connor’s rider Ross Mullholland and a total of eight horses. “Out of the eight horses we have with us, I compete two and Ross six. Three of them are young horses, which means they compete from Tuesday to Thursday and the other three during the weekend. I jump both my horses during the weekend, and so far they have been jumping great. We start every day at 7 AM and finish around 7 PM. In the morning we feed, muck the boxes, walk the horses and then start riding so that they all get out both before and after lunch. It’s so many rings here, which means there are several opportunities for what you can do with the horses while you are here. You can basically jump whenever you want to and wherever you want to, and in a different ring every day. The Sunshine Tour is a great place to develop the horses, and to get them started for the season ahead. You can start low, and then gradually build up towards what you need each horse ready for later on in the season. I also find that with all the riders here, you can watch and learn a lot – just by all the flatwork that goes on in all the rings every day. “Well, I love the Sunshine Tour because in my opinion it is the best place to start the year. It is perfect footing, beautiful grass rings – a great experience for all the horses, not just the young ones. Also for the older horses, it is some of the best surfaces you can jump on. When we get here in February, it is sometimes a little bit rainy and windy for the first weeks. So, I make sure to bring all the Kingsland rain-gear and rain-pants, as well as a good change of clothes in my tack trunk in case we get rained out. But, right now we are on week three and it is beautiful sunny weather so we can ride in our pretty short-sleeve Kingsland shirts. I have six horses with me. A day at the show normally consists of me flatting all the horses, also the ones I am showing – but if we are getting short on time I will ride probably three or four and then my stable manager Chloe will ride one or two. This year I don’t have young horses with me, so I am doing most of the international classes – that means our schedule generally starts on Thursday and goes through to Sunday. We make a plan for each of the horses at the beginning of the week – ride in the morning and then they do their respective classes. A few weeks ago, the Kingsland-crew made the trip to Vejer de la Frontera – our location for the photo shoot of the 2017 Summer Collection. Meeting us there were Kingsland riders Reed Kessler, Gregory Wathelet, Guy Williams, Camilla Storemark and Maria Kingsrød – who are all competing at this year’s edition of the Sunshine Tour. The Sunshine Tour is staged at Dehesa Montenmedio, a property of 500 hectares located in beautiful surroundings with a view towards Vejer de la Frontera – a white hill top town that creates a stunning backdrop to the many show rings. With the closest neighbour being a quiet wood of 60 hectares, the horses can also enjoy some peace and quiet hacking out while for the equestrians the beaches of Sacti Petri, Zahara de los Atunes, Barbata, Caños de Meca and Conil offer a break from the busy show ground. 1995 was the first year of the Sunshine Tour. 22 years later, and the tour has established itself as one of the most popular on the circuit, and every year horses and riders from all over the world make the travel to Vejer to compete at the six-week tour. Amateurs and professionals, kids and adults, young horses and Grand Prix horses – you will find it all at the Sunshine Tour. 450 riders from 46 countries and 1500 horses jumping; seven large grass arenas and six all-weather rings for training and competition; almost a thousand permanent boxes for stabling; a 15 km area for hacking; surfaced parking for 250 trucks. Small numbers do not exist at the Sunshine Tour. For the riders, the days can be busy and long. From Tuesday to Thursday the young horses aged five to seven are in action, while other horses can jump in the clear round rings – a great opportunity to train and get ready for the competitions ahead. On Thursdays, the older horses start jumping with the Medium and Big Tour competitions seeing some of the world’s best riders competing. The highlight of the weeks at the Sunshine Tour are always the Big Tour Grand Prix competitions, held on Sundays – which attracts plenty of audience who enjoy watching top sport. Our Kingsland riders have very different days and weeks at the tour. Gregory Wathelet (BEL) has brought with him not only his own horses to compete, but a big group of students that are training with him – filling up 51 boxes. Gregory’s schedule is of the hectic kind with a mix of competing younger horses and more experienced ones, as well as training his students. The European Vice-Champion also travels back and forth with five-star competitions in Doha and Paris in between; there is not much room to relax – although an occasional TV game might be made room for before he jumps to bed. Then there is Camilla Storemark (NOR), who is at the Sunshine Tour on a new adventure. The 25-year-old recently started to work for Irish rider Cian O’Connor’s Karlswood Stables, and competes at the tour alongside O’Connor’s rider Ross Mullholland with a team of younger horses aimed for the top sport. The youngest Kingsland rider at the tour is Maria Kingsrød (NOR), who at the age of 15 will combine competing her horses in Spain with school at home in Norway – requiring hard work, structure and plenty of travelling hours. Starting 2017 off with a bang, 2016 Olympic bronze medalist Laura Graves and her Dutch Warmblood gelding Verdades have already made headlines with their brilliant performances in the last few months. In January the team took the leading position at the Adequan Global Dressage Festival with a score of 76.66%, only to then go on to win the FEI Grand Prix Freestyle CDI 5* with an outstanding score of 82.0%! With so much success already behind them, and currently ranked fourth in the world, Laura and her team now set their sights on the upcoming Longines FEI World Cup event to be held in Omaha Nebraska at the end of March. 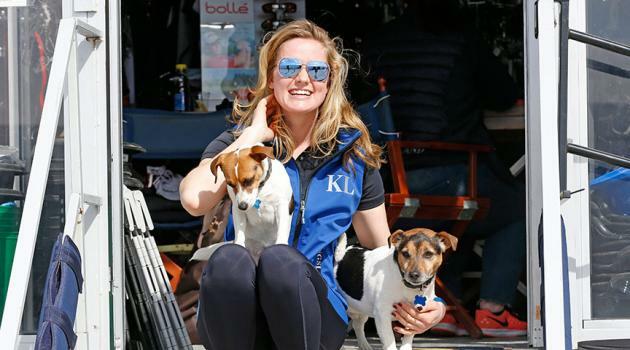 Having become a part of the Kingsland Team in 2015, Laura and her team at CrossTies LLC have been a true asset to the Kingsland brand as an accomplished international FEI competitor and respected professional in equestrian world. Kingsland takes immense pride having Laura and her team representing the brand, and look forward to supporting them as brand ambassadors many rides into the future. With only a few short weeks remaining before the start of the Longines FEI World Cup, the Kingsland team wishes Laura and her team the very best of luck and hopes to cheer them on as competitors amid their fellow equestrian elite at this year’s World Cup event! Other Kingsland Team riders that has made it through to the Final, are Show Jumpers Leopold van Asten (NED) and Gregory Wathelet (BEL). We’ll be cheering for you all!